Your Humble Potentate of Profundity has been very sick. I have been battling a kidney infection and probably waited a few too many days to go to the doctor. When one has been involved with the medical establishment as much as I have over the course of these 38 years the compulsion to shake things off and treat one’s self with over-the-counter remedies is overwhelming but not always wise. At any rate, I am happily on the mend and slowly but surely beginning to regain a sense of normalcy, which means the desire to write is coming back as well. The truth is I have probably a half dozen things in the hopper but just haven’t had the energy or mental acuity to make it happen. That ends now. I can think of no better way to get back in the saddle than by finally, at long last, finishing The Top 100 Favorite Movies series with the top of the heap, the cream of the crop, A number 1. I began this endeavor with a short intro on April 11, 2009 in which I stated my belief that “greatness takes time”. The funny thing is, out of all the films in this list the #1 spot belongs to the one movie to which my logic probably never applied. Its gravitas and superiority have been recognized almost since the day of its release and a tremendous reputation has just grown over the past four decades. I have seen it called “the perfect movie”, amongst a plethora of other accolades and complimentary reviews. When I take into consideration my own tastes…the penchant for comedy, a general aversion to violence, and gravitation toward lighter fare…I am, quite frankly, shocked that I ever fell in love with this movie. I lay all the blame on my Dad, who had me watching our subject du jour from a very young age. So I suppose it is apropos that we reach the top of this very long trek just a few days after Father’s Day. Thanks Dad. As if anyone who has been following this series has not seen it coming from miles away, it should surprise no one that the film in question is 1972’s Francis Ford Coppola/Mario Puzo magnum opus The Godfather. The Godfather is similar, in a sense, to Field of Dreams, in that Field of Dreams is often lazily painted as “a baseball movie” when in fact it is so much more, while The Godfather is too easily pigeonholed as “a gangster movie” but is far more…far better…than that simplistic definition. And while some have been critical over the years that The Godfather glamourizes mob life, I couldn’t possibly disagree more. The truth is that Coppola glamourized movie making again, and the subject matter just so happened to involve The Mafia. I cannot imagine that there are many amongst us that have not seen The Godfather. Maybe it isn’t necessarily your cup o’ tea, but you have seen it. 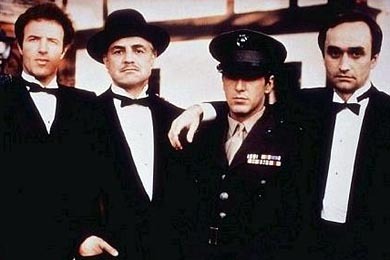 It is the story of the Corleone family in New York…patriarch and mob kingpin Vito (played by the legendary Marlon Brando), hothead oldest son Sonny (played by James Caan), dimwitted middle son Fredo, and youngest son Michael (played by Al Pacino), who has stayed out of the family business and served his country as a Marine in WWII. 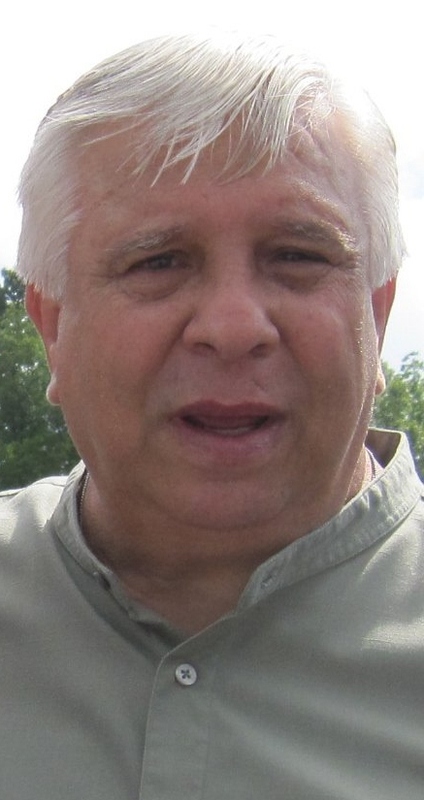 Vito also has a daughter, Connie (played by Talia Shire, better known as Adrian in the Rocky series), and an honorary son, his consigliere (counselor) Tom Hagen (played by Robert Duval). When Don Vito refuses to get into the narcotics business he is nearly killed, and not-ready-for-primetime Sonny takes control of The Family. Unfortunately he is murdered as well, which means that eventually Michael steps in and proves to be even more cool and calculating than his father. 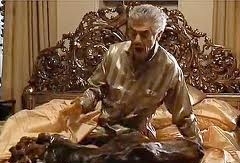 Is there a lot of gunfire and bloodshed in The Godfather?? Yes, there is. But unlike so many movies today, the violence doesn’t seem to be superfluous. We understand why these murders are taking place and it all seems to fit well within the context of the story. And while I don’t agree with the sentiment that the movie glorifies the mob, I do think it looks at it in an unflinching, no holds barred, non-watered down manner, which I feel is the appropriate way to go. If the violent content had been sanitized or lightened up then I think that would have been more veneration of organized crime than anything. As it stands I do not know how anyone can watch The Godfather and say to themselves “Now THAT is what I want to do with my life!!”. I suppose maybe the haters think that the movie tries to justify the criminal activity of the Corleone family by painting them as honorable men who have their limits and are just trying to make their way in the world. I guess I can see a bit of logic in that, but even then one really needs to pay more attention. 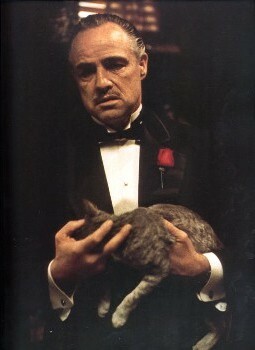 Vito Corleone is clearly conflicted, even though he says “I work my whole life, I don’t apologize, to take care of my family. 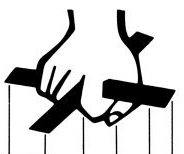 And I refused to be a fool dancing on the strings held by all of those big shots. That’s my life, I don’t apologize for that.” We learn later on in Part 2 of the trilogy of Vito’s humble beginnings in Sicily, his arrival in America, and how he first got involved in La Famiglia. But he wanted more for his family…especially youngest son Michael. And the entire trilogy itself is in large part about the fall of Michael Corleone and his struggle to become “legitimate”. Far from glamourizing anything, The Godfather is a melancholy tale of bad choices, wrong turns, and flawed logic mixed with good intentions. However, it is just so well written and well-acted that somehow it ends up being an enthralling entertainment experience rather than a depressing one, like Leaving Las Vegas or anything starring David Arquette. Even the supporting characters in The Godfather are a rich tapestry woven into the story in such a way that they are far from excessive. There’s Diane Keaton as Michael’s girlfriend/wife Kay, bitter film director Jack Woltz who wakes up with a shocking bedfellow, caporegimes Clemenza and Tessio (played by Abe Vigoda), Vegas impresario Moe Greene (a character based on real life gangster Bugsy Siegel), crooner Johnny Fontane (widely assumed to be based on Frank Sinatra), “Turk” Solozzo the drug dealer who begins the war between the families, infamous Corleone enforcer Luca Brasi, and Connie’s husband Carlo who is famously beaten to a pulp by Sonny and later eliminated on Michael’s orders. I could go on & on. No wonder it took Coppola nearly 3 hours to fit it all in. Oddly enough though, few people complain about the extensive length of the film. I suppose folks only do that when it’s not a very good movie. Everything about The Godfather is nearly flawless. The music is minimal but vital. The cinematography is masterful. The acting…especially when one considers that Pacino & Keaton were complete unknowns, Duval & Caan were only slightly more experienced, and the studio wanted Danny Thomas instead of Marlon Brando…is superb. Coppola has a real eye for talent. 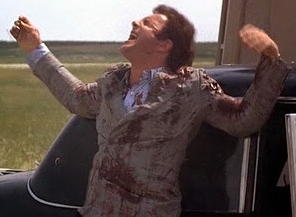 There are so many scenes that are nothing short of legendary – The Baptism…the death of Sonny Corleone…the beating of Carlo by Sonny…”Luca Brasi sleeps with the fishes”…Michael’s assassination of Solozzo & McCluskey…the horse’s head. There aren’t that many memorable scenes in the average lot of 10 movies nowadays, let alone just one. My own personal favorite is the hospital scene where Michael’s quick thinking saves his wounded father from being finished off and the prodigal son softly whispers to his father “I’m with you now”. It marks the turning point and the beginning of the ascent…or descent, depending on one’s perspective…of Michael Corleone. There are actual management and philosophy courses taught at universities based on The Godfather. It is well known as a great source of wisdom for all types of life situations. 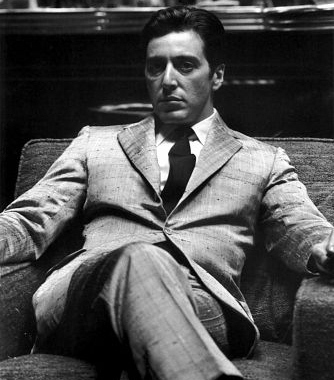 “It’s not personal, just business.” “Never take sides against the family.” “Leave the gun, take the cannoli.” “Never let anyone outside the family know what you are thinking.” “Keep your friends close but your enemies closer.” “Women and children can be careless, but not men.” “I’ll make him an offer he can’t refuse.” “Gambling…they consider a harmless vice. But drugs, that’s a dirty business.” “I have a sentimental weakness for my children and I spoil them. They talk when they should listen.” “In Sicily, women are more dangerous than shotguns.” “My father is no different than any powerful man, any man with power, like a president or senator. – Do you know how naive you sound, Michael? Presidents and senators don’t have men killed. – Oh. Who’s being naive? ?.” “I believe in America. America has made my fortune. And I raised my daughter in the American fashion. I gave her freedom but I taught her never to dishonor her family.” “A refusal is not the act of a friend. Certainly he can present a bill for such services; after all… we are not Communists.” “A man who doesn’t spend time with his family can never be a real man.” “A man in my position can’t afford to be made to look ridiculous.” “I don’t like violence. I’m a businessman. 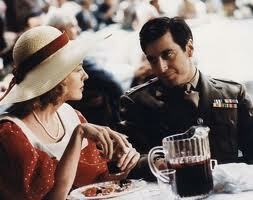 Blood is a big expense.” “We don’t discuss business at the dinner table.” Either Puzo or Coppola are geniuses. Maybe both. One thing is for sure though…The Godfather is that rare movie experience during which one can be entertained and educated. I would be remiss if I did not mention that The Godfather is based on a book of the same name, the author being the aforementioned Mario Puzo. The book actually covers events in both of the first two Godfather films, and even expands on certain storylines such as Johnny Fontane’s career and connection to the Corleone family, Sonny’s sexual exploits, and Fredo’s adventures in Vegas. I very much enjoyed reading the book and would highly recommend it to anyone who enjoys a great novel, but I cannot go so far as to say it is better than the movie. That is not so much an indictment of the book as it is a testament to the immense quality of the movie. So now we come to the end of the journey. I hope my readers have enjoyed the trek through these 100 films and may even check out some that they haven’t had the pleasure of seeing. We all have our own trials to bear in life, and we cannot always escape from the real world. But every once in awhile I believe it necessary to temporarily get away from our daily aggravations and hardships. Whether it is a good book, a long hike, good music, or an entertaining movie, we need those little mini-vacations from stress & discord. These 100 movies always provide me with that much needed respite, and I hope a good portion of them may have made your lives a bit easier on occasion as well. I think one attribute of the movie is that it really portrays the intensity and ethos of the Italian character. Most non Italians could never catch the nuances of expression and body language. Even of those in no way connected with crime. Still go with Dr. Zhivago. I’m not sure I could pull off a worst list because if it’s really bad I don’t watch it *lol*.